While searching for the perfect tree to plant in our front yard, I asked the garden center owner, “When is the right time to plant a tree?” He responded, with years of experience and wisdom, “Ten years ago.” He is exactly right! I love a home landscape with large, established deciduous trees. I might even be classified as a tree hugger; I bet I could even convince my three girls that it is fun to hug trees. Trees have such a presence, adding value and beauty to the home. However, this is delayed gratification; as you know, it takes years for trees to mature to full size.For many years my parents operated a garden center, selling live trees in the summer and in the winter they sold Christmas trees. It baffled my dad that families would, without hesitation, spend between $40 and $100 on a dead Christmas tree. In contrast, when the same families were buying live trees they would hesitate to spend their money on trees that would live and add beauty for decades. 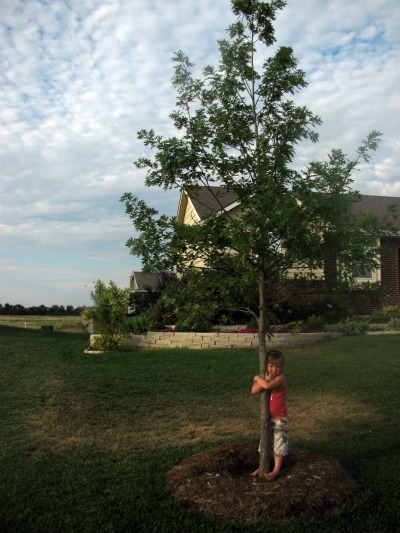 Whether you have large, established trees or just added a new sapling to your landscape, you have an investment of time and money that is worthy of your care. As a tree owner (or hugger) I will care for my trees by providing adequate water, fertilizing when nutrients are lacking, and pruning to improve the trees structure. For example, I currently have a river birch with yellow leaves instead of green. Upon closer examination, the yellow is between the green veins of the leaf. 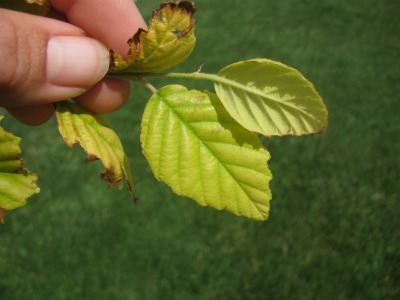 This is an indication of iron chlorosis, a deficiency that occurs because the iron in soil is not available due to a high-pH level. To correct this deficiency, I will apply aluminum sulfate which will reduce the soil pH, making the iron in the soil more available to the tree roots. Since my tree is rather small, this is an easy problem to fix. Larger trees suffering from iron chlorosis will need more intensive intervention. I suggest you contact your county extension agent or garden center for advice if you have this problem. As my friend at the garden center reminded me, planting trees is a good investment in the future. Happy Planting!